Hey twitter, the CSU’s current anti-refugee line may be inspired by rise of AfD and upcoming elections, but it is hardly new. Lubbers et al. 2002 report (for the 1990s) that the CSU was responsible for Germany having one of the most restrictive “anti-immigrant climates” in Western Europe, that the CSU they were the most anti-immigrant Christian Democratic party in the sample, and that they outscored the Italian AN (then still a borderline case for Radical Right membership). Lubbers, Marcel, Mérove Gijsberts, and Peer Scheepers. “Extreme Right-Wing Voting in Western Europe.” European Journal of Political Research 41 (2002): 345–378. Kommentar bei heute.de zur Flüchtlingskrise und zu Merkels Amtsverständnis, mit etlichen Wortlautzitaten von mir. Sie haben leider eine Seite aufgerufen, die unter der aufgerufenen Adresse nicht verfügbar ist. Möglicherweise liegt Ihnen ein "toter", nicht funktionierender Link vor oder die Seite ist aus technischen Gründen nicht erreichbar. Seehofer issues Merkel another ultimatum. So what? There is no doubt that Bavaria is struggling to accommodate the large numbers of refugees crossing the Austrian-German border every day. Bavaria’s infrastructure is already stretched, and, more importantly, the lack of co-ordination with the Austrians, the other German state governments, and the German federal government is nothing but baffling. 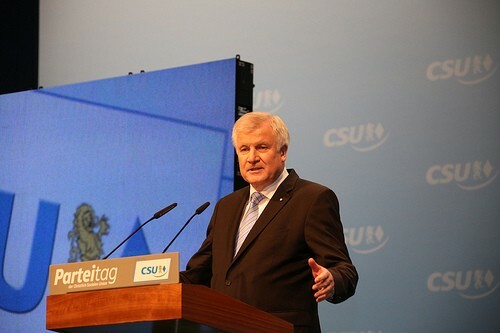 There can also be no doubt that faced with the rise of the AfD and Pegida, Horst Seehofer, Minister President of Bavaria head of the CSU, feels the need to occupy and protect the political space to the right of the CDU. Weil Österreich Busse mit Flüchtlingen einfach weiterleitet, sind die Zustände an der Grenze chaotisch. CSU-Chef Seehofer setzt Merkel eine Frist bis Allerheiligen - doch die Kanzlerin mahnt zur Geduld. Build a fence at the border? Leave the federation? 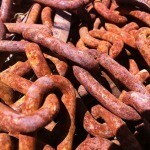 Take the issue to the FCC? We don’t know, because he doesn’t say, presumably because he doesn’t know. Is there potential for anti-refugee left-wing populism in Germany? In the last couple of weeks, much has been said and written about the turning tide in German public opinion on refugees, the growing rift between Merkel and the CSU, the potential of a back-bench rebellion against the chancellor and party leader etc. But one of the most interesting (in my book) details is buried in the nitty-gritty details of Friday’s Politbarometer report, which I turned into a little bar chart to illustrate my point. 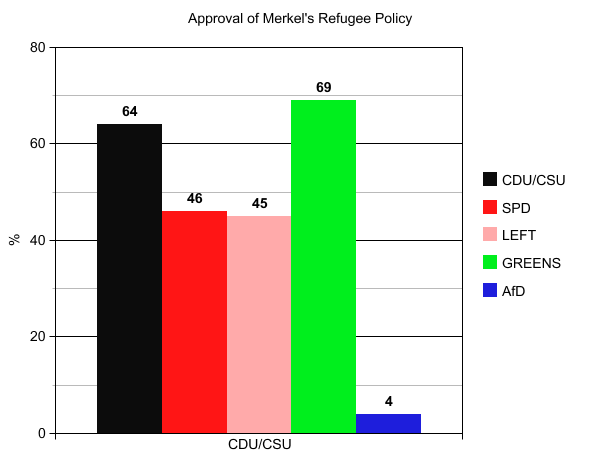 So 64 per cent of the Christian Democrats’ supporters still approve of Merkel’s policies (and that includes the allegedly outraged CSU voters). But support is significantly lower amongst supporters of the Social Democrats (SPD) and Socialists (Left). This could be written off as coloured by partisan sentiment. It might even be the case that some lefties are unhappy because they want more generous policies. But compare this with the approval rating amongst supporters of the left-liberal Greens. Unlike the SPD and the Left, the Greens gun chiefly for the upper-middleclass lefty vote. Cue my article on competition between traditional left-wing parties and working class parties 2.0, i.e. the radical right. Yesterday, the AfD has filed legal complaints against the chancellor with the public prosecutor, arguing that suspending the Dublin agreement violates the section of the penal code which bans human trafficking. As political PR stunts go, this is not a bad one: It cost the party exactly nothing (anyone can have a friendly chat with the prosecutor, no lawyer required, no legal fees), made for a couple of incredulous headlines and so far gained them 13,646 likes and 4,616 share on their Facebook page alone. The prosecutor will at least have to have a look before dropping the non-existent case in silent despair. Obviously, the CSU’s dervish-in-chief, Horst Seehofer, felt the need to up the ante and mumbled something about Bavaria challenging Merkel’s policies in the Federal Constitutional Court. His rationale (if this is the right word) is that the refugee situation is undermining Bavaria’s ability to exercise the (partial) sovereignty German states enjoy under the federal constitution. None of this holds any water (if you read German, here is a beautifully written article on the legal/political questions involved) but at least, Seehofer’s threat made the evening news, displacing the earlier headlines. Not a bad result if your aim is to out-AfD the AfD.